Register Early & SAVE! Extrusion 2018 is the event of the year for extrusion processors of all kinds! 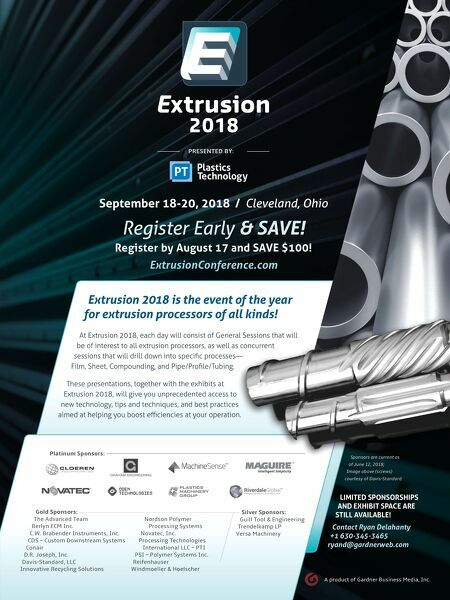 September 18-20, 2018 / Cleveland, Ohio At Extrusion 2018, each day will consist of General Sessions that will be of interest to all extrusion processors, as well as concurrent sessions that will drill down into specific processes— Film, Sheet, Compounding, and Pipe/Profile/Tubing. These pr esentations, together with the exhibits at Extrusion 2018, will give you unprecedented access to new technology, tips and techniques, and best practices aimed at helping you boost efficiencies at your operation. Platinum Sponsors: Gold Sponsors: The Advanced Team Berlyn ECM Inc. C.W. Brabender Instruments, Inc. CDS – Custom Downstream Systems Cona ir D.R. 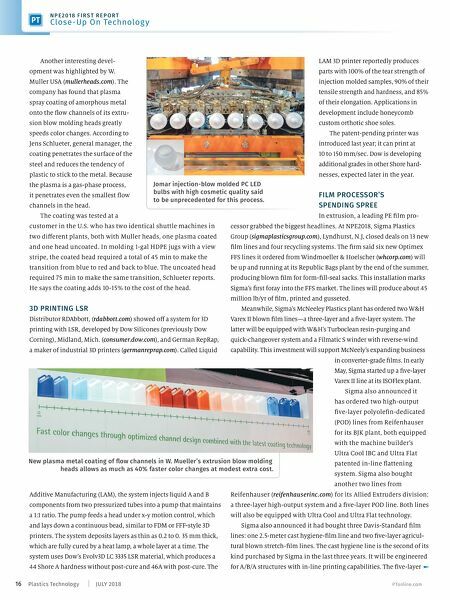 Joseph, Inc. Davis-Standard, LLC Innovative Recycling Solutions Nordson Polymer Processing S ystems Novatec, Inc. Processing Technologies International LLC – PTI PSI – Polymer Systems Inc. Reifenhauser Windmoeller & Hoelscher Silver Sponsors: Guill Tool & Engineering Trendelkamp LP Versa Machinery LIMITED SPONSORSHIPS AND EXHIBIT SPACE ARE STILL AVAILABLE! Contact Ry an Delahanty +1 630-345-3465 ryand@gardnerweb.com Sponsors are current as of June 12, 2018; Image above (screws) courtesy of Davis-Standard Register by August 17 and SAVE $100! ExtrusionConference.com PRESENTED BY: A product of Gardner Business Media, Inc.